Jason Zweig’s recent Wall Street Journal article “Give Yourself an Investing Makeover,” discussing the transformation of Guy Spier’s investing habits, piqued my interest. Along with money manager Mohnish Pabrai, Spier was the winning bidder of a charity auction lunch with Warren Buffett in 2008, and his Aquamarine fund has enjoyed superb performance. Curious, I did a little digging. When it comes to the question, “Did I beat the market?” the answer depends on which market. Different asset classes have different risk and return characteristics. 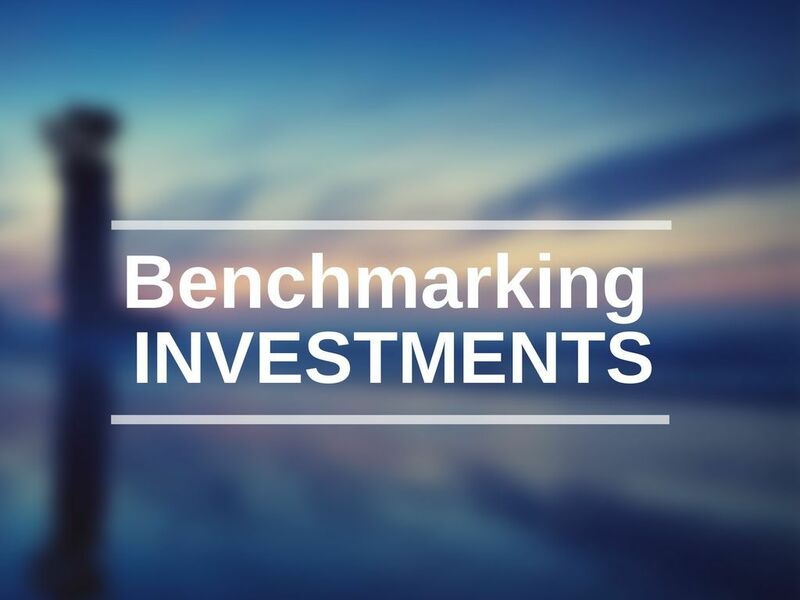 Because Spier invests in stocks priced low relative to earnings or assets, a value-oriented benchmark provides a more fair comparison than the S&P 500, which is composed of big companies and agnostic about relative price. 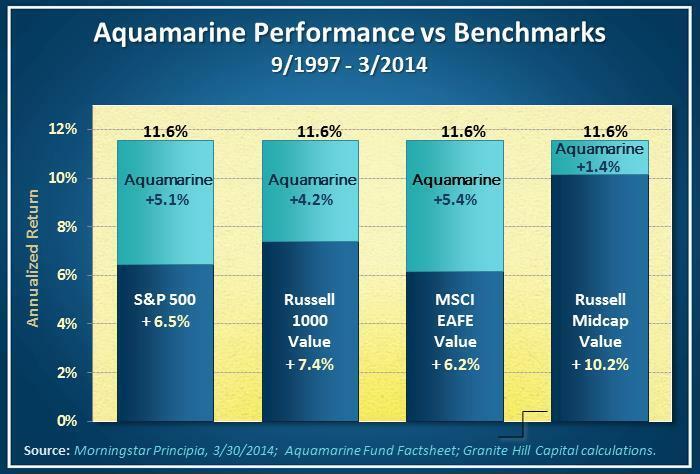 As the graph below shows, the Aquamarine fund returned 11.6%, 5.1% better than the S&P 500. While that outperformance shrinks to 4.2% when compared to the Russell 1000 Value index, composed of US big companies low in relative price, it’s still superb performance. Spier limits disclosures of stocks held, but small company and international stocks have appeared in his portfolio. If international companies low in relative price dominated Spire’s portfolio, a more appropriate benchmark could be the MSCI EAFE (Europe, Asia, Far East) value index and outperformance would expand to 5.4%; in contrast, if he focused on US smaller mid-cap stocks, comparable benchmark outperformance would fall to 1.4%. Adding stocks low in relative price (value stocks) can goose performance relative to broad indexes. How much of a boost can you expect? 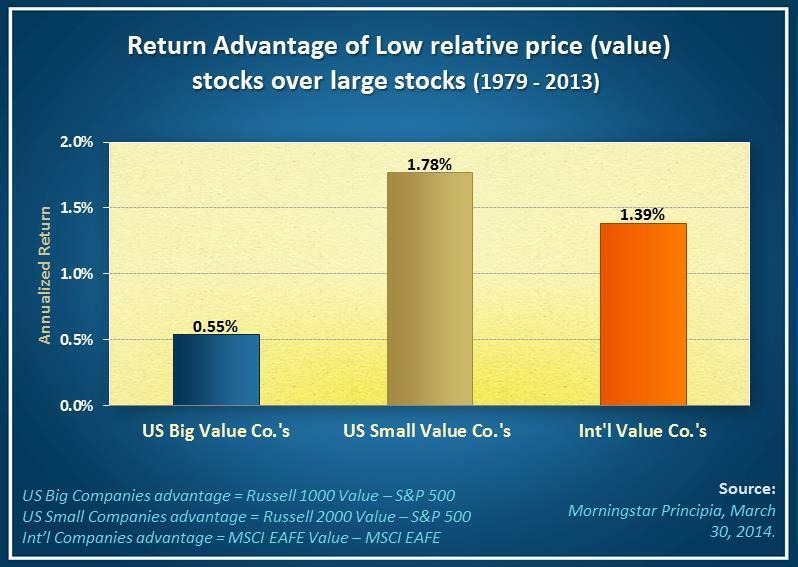 Large value and small value indexes outperformed the S&P 500 by 0.5% and 1.8%, respectively, since 1979. International value outperformed a broad international index by 1.4%. This advantage may seem small, but over time the compounding effect translates into significant differences in wealth. What causes the return advantage that value stocks command? One story is risk. These companies are often financially distressed or have poor prospective growth and greater vulnerability to a bad economy than financially solid or high-growth companies. That risk has provided incremental compensation to investors. As long as investors are averse to risk, the advantage should continue. If you own a value fund and compare its performance to a broad market index, at times you may be unnerved. 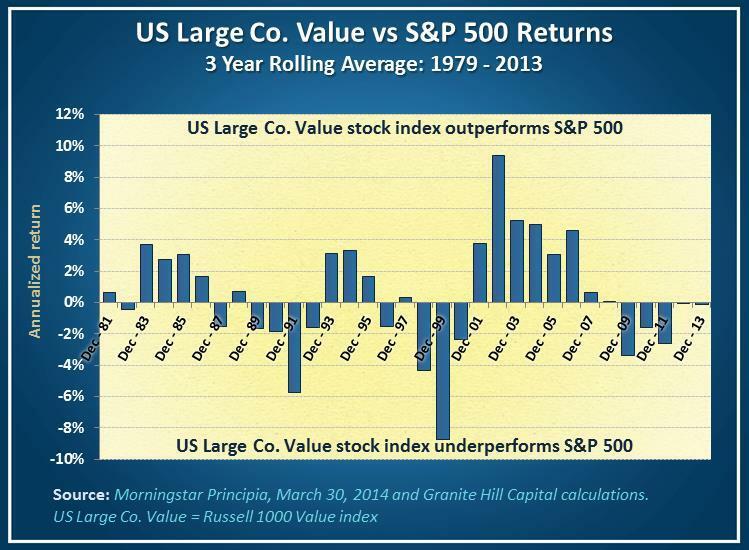 Large company value funds which track an index can diverge significantly from the S&P500 as the graph below shows. Take the late 90s, for example. During that giddy period, growth stocks (e.g., tech stocks) were a levitating force driving the S&P 500. Value stocks suffered lagging the S&P 500 by an annualized 8.7% for the three years ending in December 1999, leading plenty of investors to switch to more growth-oriented funds. Large value’s underperformance turned with a vengeance for the three years ending December 2002 when they beat the S&P 500 by 9.4%. Lack of discipline was a costly mistake. Exercise independence in your research. Spier first reads SEC annual and quarterly reports, proxy statements, and only then the research of Wall Street and other news outlets. Media news can be disorienting, as noted in “Framed” Financial Performance News: What You Can Do About It. Spier likely runs a concentrated portfolio with relatively few stocks, rather than a broadly diversified one. That can cause trouble. Take the example of Bill Miller’s concentrated portfolio. 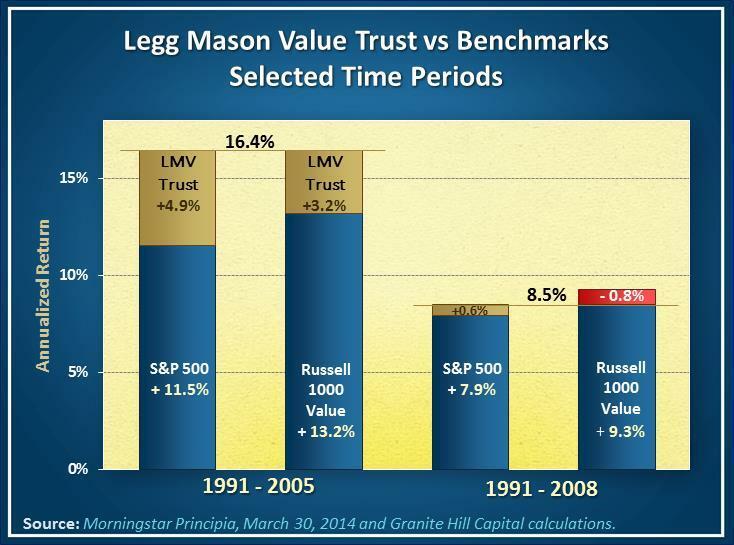 After beating the S&P 500 every year from 1991 to 2005, Miller’s Legg Mason Value Trust surpassed both the S&P 500 and Russell 1000 Value index by an annualized 4.9% and 3.2%, respectively. It stumbled badly from 2006 through 2008. Outperformance collapsed to 0.6% versus the S&P 500 and missed the more appropriate Russell 1000 Value index by 0.8%. All these comparisons reveal a risk factor with a history and rationale for compensating investors, namely, low relative price (value). You have a choice in how to access it: search for a manager who actively seeks value stocks or invest in broadly diversified funds that target and capture not only the value risk factor but others. 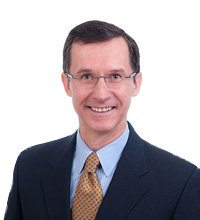 We specialize in reviewing and implementing options for the latter choice to eliminate the risk of concentrated portfolios and manager missteps. These targeted funds typically carry significantly lower fees and are more tax-efficient than actively managed funds. If you are interested in this alternative approach to investing, call or email.